LNG-powered GT1 sets new world record. The Russian-developed GT1-001 gas turbine-electric locomotive has successfully undergone further field tests in Moscow, in readiness for deployment on non-electrified freight-intensive areas of the railways. Hauling 16,000 tonnes in 170 rail cars, a new world record for a single prime mover with an internal combustion engine, the 300 tonne two-section GT1 combines a turbine and power unit with a separate section containing the 17 tonne liquefied natural gas (LNG) fuel tank. The engine can develop 8300 kW of power and when fully fuelled can drive the train 750 kms with a top speed of 100 km per hour. The new world record was set at the Institute of Railway Transport pilot ring in Shcherbinka, Moscow on September 7. Quests and participants of the III International railway salon “Expo 1520”, including Eugene Pronin of NGVRUS, were invited to witness the trial. Pronin confirmed with NGV Global that media reports of the locomotive using compressed natural gas (CNG) were incorrect as the locomotive runs on LNG. 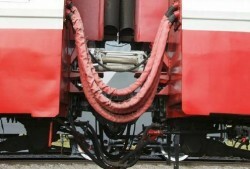 Cryogenic hoses transport LNG from the fuel car to the locomotive. The 6 km ring track limited the test train’s length to 2.3 km. 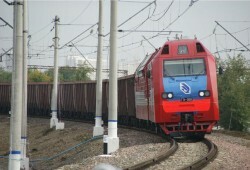 Project manager, Vladimir Rudenko of the Research and Design Technological Institute, believes the locomotive is capable of even bigger loads when operating on main rail lines. “Actually, GT1 will be able to carry the weight and composition of 20,000 tons,” he said after tests in late 2010. In line with the Russian Energy Strategy, Russian Railways (RZD) has set a goal of replacing up to 30% of diesel fuel used in internal combustion engine-powered locomotives with natural gas by 2030.